What speaks to the pride and soul of being an American more than our national parks? Few places can compete with the unmatched beauty that is found in both Grand Teton and Yellowstone National Parks, from the unobstructed views of alpine forests and mountain skyscapes as far as the eye can see, to witnessing active wildlife in their element, to viewing natural wonders and hot geysers all over both parks, there truly is no end to the vast amount of ways one could explore both regions. Jackson Hole is the perfect place to stay if you are looking to explore both of these cherished destinations in one trip. Grand Teton National Park is home to over one thousand miles of trails, rivers, and mountain views for the avid outdoor adventurer. Rock climbing, hiking, mountain biking, trail running, photography, wildlife viewing, whitewater rafting, and scenic floats are all popular activities that tourists and locals enjoy participating in in the national park. Early mornings and early evening hold the promise of seeing the most wildlife, including bears, moose, elk, wolves, and deer. These transitioning periods of the day, also, provide the greatest canvas for photography opportunities. 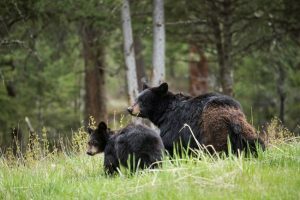 There is a chance you’ll see Grizzly 399 or “Blondie” from your car along the roadsides, two of the most beloved grizzly mothers that have new cubs every spring, to the delight of tourists and locals alike. We highly recommend bringing your binoculars and best camera to capture some of the activity you will encounter in the transitioning light of the day. A few of the most popular destinations in the park, include: Hidden Falls hike (Starting at the Jenny Lake trailhead, 2.6 miles out and back), Taggart Trail hike (3 miles roundtrip), visiting the Craig Thomas Discovery Center, exploring the Grand Teton National Park road for wildlife, and visiting the Mormon Row Historic District. Parking is often limited during peak lunch periods, to ensure you get a parking space, our team recommends arriving to any trailhead or observation point in the early hours. Yellowstone, America’s first National Park, is home to over three thousand miles of wildlife habitat and geographic wonders. If traveling from Grand Teton National Park, you will come into Yellowstone via the south entrance. 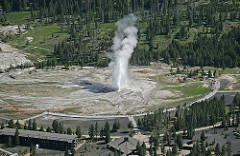 Some of the most popular destinations lay on the lower “loop” including, West Thumb/Yellowstone Lake, Canyon Village and the Upper Falls of the Yellowstone River, Artist Point (which is just a few miles away from the Upper Falls parking lot), Madison Junction, the Firehole River, and Old Faithful (the most famous geyser in the park, which goes off roughly every 45 minutes). If you’re willing to drive a little farther to get away from the crowds, Lamar Valley has some of the greatest wildlife viewing opportunities of any other region in the park, including wolf packs and black bears. We recommend caution, as always, in these highly prized wild places and remember to always carry bear spray and to travel in groups. If you have the time, we’d recommend spending some time in West Yellowstone and enjoying the Imax Theatre and the chance to get up close and personal with the hardest to see wildlife at the Grizzly & Wolf Discovery Center. Come experience the adventure that John Colter and other members of the Lewis & Clark Expedition first came across in the early 1800s for yourself. The magic felt in these revered places cannot be replicated anywhere else. Our reservation agents are happy to answer any of your questions about making your experience out West one to be remembered.